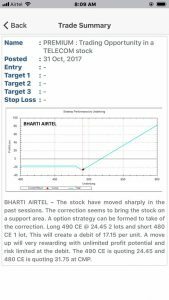 Bharti Airtel was recommended to Premium ProRSI mobile subscribers on 31st October 2017. In just one day the option strategy gained 80%. For High Probability Trading Download the Mobile application and Go Premium.